The next composer that might need our attention in this French Composers’ Names series intended to help people pronounce French composers’ names is probably Camille Saint-Saëns. The diacritic, the mark, on the e is called a tréma in French. It consists of two dots ( ¨ ) placed over a vowel, used to indicate diaeresis. It is very clear in a word like maïs (corn): the combination of a and i would give an è sound, but the diaeresis is here to prevent this combination: mah – eess. Now, sincerely, as a French person, I would say that Saint-Saëns’ name is also confusing for us. The tréma appears on a vowel followed by an -n, usually triggering a nasal sound… In this context, what is one supposed to do with the diaeresis?! Link to MP3 – Camille Saint-Saens | Get Camille Saint-Saëns scores! 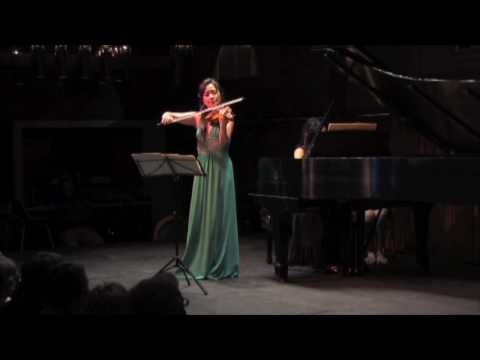 And here is a great HD video of Saint-Saëns’s Violin Sonata No. 1 in D minor, performed by Grace Fong and Chee-Yun during the 2009 Innsbrook Institute.